A Grandson of slaves, a boy was born in a poor neighborhood of New Orleans, known as the "Back of Town". His father abandoned the family when the child was an infant. His mother became a prostitute and the boy and his sister had to live with their grandmother. Early in life, he proved to be gifted for music and, with three other kids, he sang in the streets of New Orleans and his first gains were the coins that were thrown to them. A Jewish family, Karnofsky, who had emigrated from Lithuania to the USA, had pity for the 7-year old boy and brought him into their home. Initially he was given 'work' in the house, to feed this hungry child. Then he remained and slept in this Jewish family where, for the first time in his life, he was treated with kindness and tenderness. When he went to bed, Mrs. Karnofsky sang him a Russian lullaby that he would sing with her. Later, he learned to sing and play several Russian and Jewish songs. Over time, this boy became the adopted son of this family. The Karnofskys gave him money to buy his first trumpet; as was the custom in the Jewish families, they sincerely admired his musical talent. Later, when he became a professional musician and composer, he used these Jewish melodies in compositions, such as St. James Infirmary and Go Down, Moses. The little black boy grew up and wrote a book about this Jewish family who had adopted him in 1907. In memory of this family and until the end of his life, he wore a Star of David and he said that it is in this family that he had learned "how to live real life and determination.” This little boy was called Louis Armstrong. What a Wonderful World! One of Grandpop's favorite songs was Louis Armstrong’s “Somewhere Over the Rainbow.” Aunt Theresa and Uncle Chubby took me to the Atlantic City Steel Pier to see him. What a performer! My book, “Growing up in the Butcher Shop“ is available at the shop or on our web page. Join our mailing list to receive menu specials and our newsletter at www.JDeFrancoandDaughters.com - Click on Mailing List and enter your e-mail. Send your Roseto stories, recipes and comments to E-mail: portipasto@epix.net or call 610-588-6991 Store Hours: 7 - 7 seven days a week with catering anytime or by appointment. Bridge Repair work beginning December 1 and continuing through December 5 between the hours of 9:00am and 3:00pm on Route 33 between Rts 191 and 248 wlll create lane restrictions north and south for work on the Main Street Tatamy Road Bridge over PA 33. Expect delays and use caution driving through the work zone. Drainage work on River Road between Delaware Drive and Marshfield Drive will create lane restriction with flagging from December 3 through December 5 between the hours of 9:00am and 2:00 pm. The East Bangor UMC Singles' Ministry will enjoy a covered dish Christmas Party on 6:30pm Friday December 5 in the Fellowship Hall. The church is located at 136 W. Central Ave. (Rt. 512), East Bangor, PA. Please RSVP by calling Cindy (610-614-1477) or email EBUMCSM@yahoo.com. Get into the holiday spirit by listening to the sacred and secular holiday music of Northampton Community College’s community chorus, on Friday, December 5, at 7:30 p.m. in Lipkin Theatre on NCC’s Main Campus in Bethlehem Township. Under the direction of Rosemary Murdy-Haber, the vocal ensemble will perform “Gloria in Excelsis Deo,” “Hanerot Halelu,” “A La Naninta,” “It’s Beginning to Look a Lot Like Christmas,” “’Twas the Night Before Christmas,” “O, Holy Night,” “Have Yourself a Merry Little Christmas,” “The Hallelujah Chorus” and others. Admission to the winter holiday concert is a non-perishable food item for a local food bank and/or a $5 donation to the NCC Chorus Scholarship. Repurposing garage doors into stunning walls with a view(BPT) - Have you ever admired a coffee table cleverly fabricated using a discarded door sitting on a frame? Or been surprised by the sight of an old refrigerator reborn as a bookshelf or TV cabinet? Even bathroom fixtures have been known to draw notice (and a snicker or two) when repurposed as garden containers. Stat fanatic Martyn Tovey has bagged himself a place inside his favorite records book - for owning the world's largest col-lection of Guinness World Records annuals. The 57-year-old computer security consultant has spent more than 40 years building up a collection of 353 individual annuals from around the world - plus 2,164 items of memorabilia. According to The Mirror, his favorite record was set by long jumper Bob Beamon with a leap of 29-feet two-and-a-half inches at the Mexico Olympics in 1968, and the athlete mark was not eclipsed until 1991. Martyn said: "I was a fan of athletics and Bob Beamon's jump was one of the most amazing things I had ever seen. I can still remember my amazement at such an astonishing feat. "My interest in the books was driven by a childhood obsession with facts and figures. The books gave me a fantastic reference guide, which was updated with the latest data every year. I asked for one for Christmas and have had one every year since. Hopefully I will get one this year. "My favorite is the 1960 edition with handwritten corrections by Norris McWhirter, while the strangest is perhaps a 'Sportsman Set' consisting of a bottle of aftershave and a Guinness paperback book. I find out about special editions from around the world and try and track them down. "Alongside the main annuals, I collect toys, games, spin-off publications, novelty items and promotional material. I have not got a clue how much I have spent - I dare not guess." Guinness have crowned Martyn, from Radstock, Somerset, for the 'Largest collection of Guinness World Records Memorabilia' and 'Largest Collection of Guinness World Records Annuals'. Saturday, December 6th 8:00 a.m.-4:00 p.m. Spend the day birding at Jacobsburg and other places in the upper Bushkill Creek Watershed counting birds and looking for oddball species that may have wandered into the area. Participants should dress for the weather and bring binoculars and a lunch. To register, contact Rick Wiltraut at rwiltraut@pa.gov or 610-746-2801. Christmas on Broadway will be held at the Hub Teen Center in downtown this Saturday December 6 beginning at 12:30 pm with Bangor High School Chamber Choir followed by other performers. The Rotary Club of the Slate Belt will hold its annual Breakfast with Santa Saturday December 6 at The Scorecard in Wind Gap from 9:00 to 11:00am. Grace Church of Belfast will hold a Christmas Rummage Sale Saturday December 6 at the church located at 5907 Sullivan Trail from 9:00am to noon. Holiday Items, Toys, baked goods too & More. Belfast Wesley UMC 607 School Rd. Nazareth, Pa. will holds it’s annual Caroling under the pines on Saturday December 6. There will be old fashioned caroling besides a fire, They will roast hot dogs and make smores. Following fellowship They will conclude with lighting of the Christmas Tree and a song. Please come out and help them ring in Christmas Under the Pines. 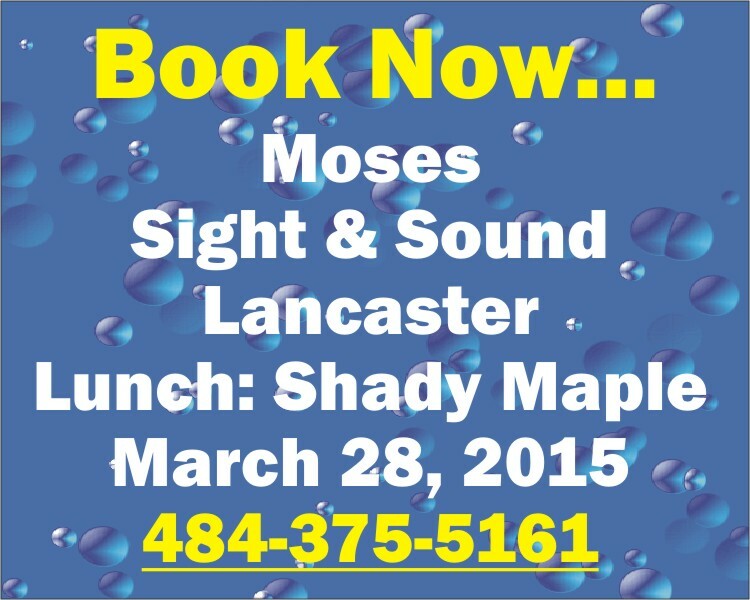 For more information please call 610-863-7772. A Fundraiser Dinner Mission of Love Ministry will be held Saturday December 6, 2014 from 4pm – 7:30pm at 555 North Main St., Bangor (food bank location). All donations will go towards Mission of Love Ministry. Come join us! God bless! Breakfast with Santa will be held at the Bee Hive 197 Pennsylvania Avenue in Bangor Saturday morning December 6 from 9-12. Adults cost $5.00, children $3.00 (children under age 2 are free). The event features a pancake breakfast, visit with Santa, crafts, photos and more. Proceeds benefit the Bangor Public Library. Tickets can be purchased at the Library or at the door. More info on Facebook at Friends of The Bangor Public Library. Saturday December 6 at Faith Christian School 122 Dante St. Roseto, Pa. from 10am to 4pm. There will be over 12 vendors including Avon, Pampered Chef, Tupperware, Tastefully Simple, Thirty-one and Park Lane. A basket raffle will also be held with money going to local food bank @ Hope Church. Bring your pets and kids for adorable pictures with the Safe Haven Rescue Santa Claws on Saturday, December 6 from 10-2 at Berger's Agway, Route 209, Brodheadsville. The pictures will cost $10 for a framed 4x6 print and an email copy, and make wonderful memories and Christmas gifts. STROUDSBURG, PA: St. John’s Evangelical Lutheran Church of Stroudsburg is pleased to announce it will be hosting Fortepianist Sylvia Berry for a free performance on Saturday, December 6th at the church’s Nine North 9th Street location in downtown Stroudsburg at 7 PM. Ms. Berry, a native of Philadelphia, has performed as a soloist and chamber musician in the US, Canada, The Netherlands, the UK, and Italy. Her debut CD, a recording of Haydn’s “London Sonatas” (Acis) recorded on an 1806 Broadwood, was hailed by Early Music America as “A wonderful debut that augurs more wonders to come." The evening’s program will include the music of Haydn, Beethoven, Dussek and Clementi, performed on an 1806 Broadwood & Son fortepiano, restored by Dale Munschy, 2011. The term "fortepiano" refers to any piano (or replica thereof) built before the 1850's. They are generally smaller and do not have full cast iron frames as modern pianos do, creating a warmer and more intimate sound. One of the most famous piano builders of this day, John Broadwood was a personal friend of Haydn’s and also presented Beethoven one of his instruments as a gift. The 1806 Broadwood used in this concert is very similar to the ones Haydn played in London. In addition to the performance by Ms. Berry, the evening will also feature a Q&A session with Ms. Berry and her husband, historical keyboard restoration expert, Mr. Dale Munschy. Furthermore, the audience will be treated to a four-handed piece performed by this incredibly talented husband and wife duo. The evening will conclude at approximately 9 PM following a brief reception in the church’s Fellowship Hall. The East Bangor Volunteer Fire Company will hold a Bazaar from 10-1 Sunday December 7. Fill a bag for $2.00. The East Bangor United Methodist Community Church welcomes you to a FREE Pasta al Forno/Chicken Cacciatore/Ham Dinner on Sunday, December 7, from 4:00 - 6:00 p.m. The church is located at 136 W. Central Ave. (Rt. 512), East Bangor, PA. Questions? 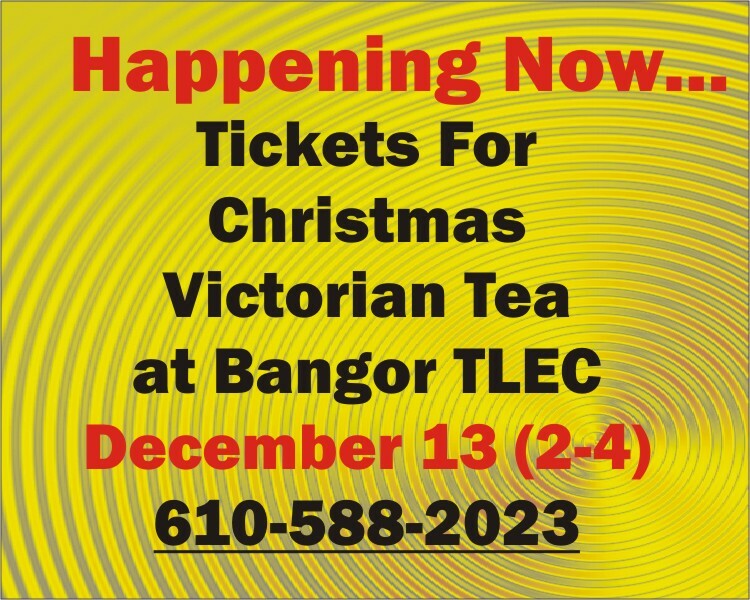 call 610-588-4453 or visit http://ebumc.org/. Come to the Blue Valley Farm Show Sunday December 7 at 1:00pm for a magical afternoon to help our U.S. Marines deliver Christmas to children in need throughout Northampton County. 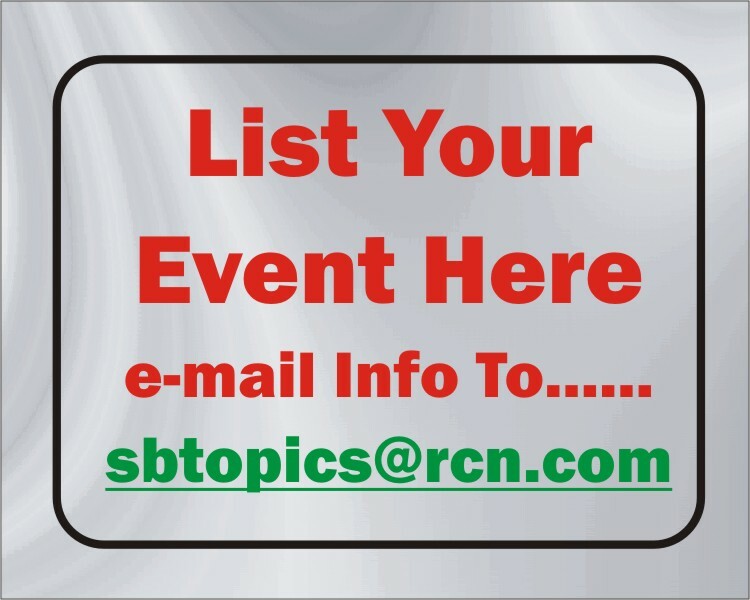 FREE 4x6 photos with Santa, Lionel Train Display, Lego Display, Live Performances by Jordyn Albanese, The New Approach, Sweet Autumn, Magical Reindeer Food Buffet by Miss Rose's Preschool, Gifts from Santa, Hot Chocolate by Girl Scout Troop 81095, Face Painting, Vendors & MORE. Please bring with you a donation of a new, unwrapped toy for a child 0-12 years of age! Portland Lodge No. 311 is proud to host ann organize this event! Please share & extend this invitation to your friends & family!! Boomer's Angels Pet Rescue will offer Pet Photos with Santa on Sunday, December 7 from 11-2 at Leck Veterinary Hospital, 115 W. Pemmsylvamia Ave., Pen Argyl 18072; and on Sunday, December 14 from 11-2 at Blakeslee Animal Clinic, 5251 Route 115, Blakeslee 18610. The cost is $10 for a 4x6 print and a digital image emailed to you. Bring all your pets and kids for a memorable photo. All proceeds go towards the pets that Boomer's Angels cares for until they find their forever homes. Safe Haven Pet Rescue will hold a dog adoption day from 11 -2 on Sunday, December 7, at Tractor Supply, Route 940, Mt. Pocono,.